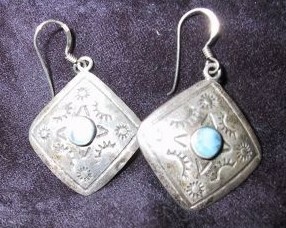 Here we feature vintage American Indian design earrings. They appear to be sterling just by the way it tarnishes, but I'm not really sure, and there is the number 825 stamped on the back rather than 925. The blue that looks like a stone appears to be painted on like enamal. This was an estate purchase. The price is only $15.50. Native American Artifacts and Crafts for Sale: Page 1 of my fine collection of authentic Native American artifacts and crafts for sale. 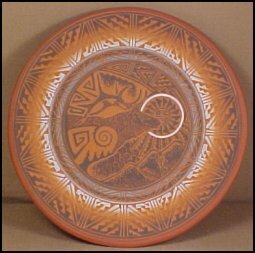 More Navajo etched pottery: Page 22 - you'll like this vase if you like the plate above!